Soft lenses: Lenses that are manufactured from plastic materials that are able to absorb water, also called “hydrogels.” They range from low oxygen permeability to high oxygen permeability (silicone hydrogels). Rigid Gas Permeable Lenses (GP Lenses): Contact Lenses that are manufactured from plastic materials that have a high oxygen permeability and do not contain water. Decorative: To change the appearance of the eye. Therapeutic: Lenses for the treatment of non-refractive disorders of the eye. Corrective: Lenses to correct refractive disorders. Conventional: No prescribed replacement schedule. The contact lens is replaced when it wears out, becomes damaged, or the patient’s power requirements change. Planned: There is a specific time period after which the contact lens will be replaced. Disposable: A contact lens that is disposed of upon removal from the eye and replaced. 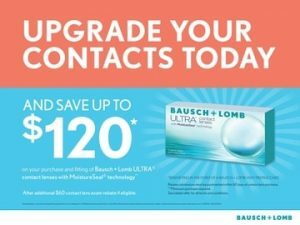 Thanks to the Contact Lens Association of Ophthalmologists, Inc. Contact Lens Docs for content used in the creation of this webpage. All rights reserved. Reproduction other than for one-time personal use is strictly prohibited.